Northgate Park is tucked in the center of the Northgate Neighborhood and has everything we need for getting our S.L.A.M. on in the Bull City! Located along the South Ellerbe Creek Trail with wide open spaces, playgrounds, and paved running paths it provides the perfect place for mamas and kids to come together. Parking lots are located on Acadia Street (near Ellerbee Street) and ample street parking is available. Look for us near the playground before class! Questions? Contact Kristen at slamdurham@strollerstrongmoms.com. On days when the weather does not allow us to hold class outside, we will make an announcement on both our Facebook and Instagram pages by 8am EST. Follow us on Facebook and Instagram @s.l.a.m.durham for the most up-to-date information! Kristen is an ACE certified group fitness instructor and CPR/First Aid certified. She has a Master in Education from Auburn University and a Bachelor in Science from the University of Oregon, where she was a Division I Women’s Lacrosse player. 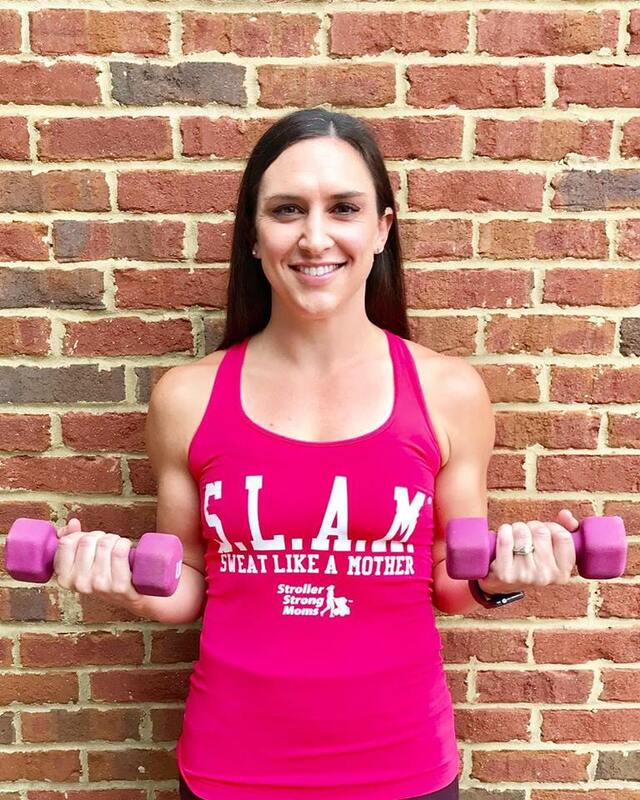 After moving to Savannah, Georgia in 2016, newly pregnant with baby number two and an active young toddler, Kristen became a member of Stroller Strong Moms – Savannah. After her first class it was clear that this was a group of women with a shared mindset of being strong, supportive, and empowering each other through fitness and friendship. Kristen maintained a high level of fitness throughout her pregnancy and postpartum recovery, had an incredible support group of mamas, and eventually took on the role of instructor! When she found out her family was headed to Durham, she knew she had to bring Stroller Strong Moms and the #SLAMstoke to the Bull City! Keep Up With SLAM'n Durham! Join SLAM Durham on Instagram! Contact the SLAM Durham Team! Kristen brings out a fire in everyone she instructs that they didn’t know they had. She will work you hard because she knows you can do it. Kristen is a dedicated leader who puts everything she has into the group that surrounds her, whatever that group may be. Stroller Strong Moms, teaching preschoolers, the neighborhood, Army spouses, friends, you name it! Her creativity keeps classes fun and interesting, while her background in fitness assures you that you will be getting an excellent workout in. Every. Single. Time. Kristen is an amazing instructor! Her classes are the perfect challenge – she is funny and super encouraging with awesome energy. Her workouts are killer, her smile is contagious, and she can make anyone feel like they’ve always been a part of the group – which is a huge deal to new moms trying to find a mom tribe. When Kristen joined SSM Savannah, she was such a natural leader in both her strength, stamina and speed, and also her attitude, positivity and encouragement. It was no surprise that she went from supporting moms as one of the group to supporting moms as an instructor, and SSM Savannah was lucky to have her! Anyone who gets to be around her can’t help but absorb a bit of her SLAM stoke. She can simultaneously push you further while still smiling next to you and spreading joy. I have no doubt that she will build just as fun, challenging and supportive a community in Durham as she helped foster in Savannah.